The first time I met Fredericton, New Brunswick native Thomas Washburn, I was moving into residence at Conrad Grebel College, two weeks after the semester had begun. I had been taking a marine sciences course at the St. Andrews, New Brunswick, fisheries research station and it overran the start of the semester. I ran into Thom in the hallway and he teased me about starting classes late. When I told him the reason, he shook my hand heartily, welcomed me to Grebel, and offered to help move me in! Without waiting for an answer, he rounded up a bunch of guys and together they unloaded my car and filled up my room in no time flat! That is the Thom I remember best - a jump in, take charge, help out, truly generous person. Another memory that easily springs to mind surrounds my birthday. It was a tradition at Grebel, back then, to surprise people with popcorn parties, in their room, on their birthday. Mine was no exception. The one small problem with these "surprises" was the huge mess they left behind, and the clean up you had to do the next day. Most people didn't mind, and recognized these spontaneous "parties" for the camaraderie inducing events that they were. The morning following the party in my room, I awoke to the inevitable "popcorn 'n pits" mess and a knock on my door. To my great surprise, there stood Thom leading fellow Grebelites Barry Friedman and Paul Close, all armed with vacuums, dusters, brooms and dustpans. They swept into my room and swept the mess into oblivion in record time! I didn't have to lift a finger. I'm such a lucky person to have known someone so thoughtful and generous of spirit! Another fond memory involves Thom's penchant for dating as many Grebel girls as he possibly could. He'd fall in and out of love frequently, but be equally passionate about his choice each and every time. One memorable crush was on Ingrid Unrau, a peace-loving, vegetarian-promoting, rather outspoken Grebel member. Ingrid even managed to convince the kitchen staff to allow her to create a completely meatless dinner night once a month. Bless her, but it was pretty awful! Now I'm willing to admit that perhaps our pizza-saturated, unsophisticated student palates just didn't allow us to appreciate those dry, tasteless lentil burgers. Whatever the reason, we all started eating elsewhere that one night a month. Except for Thom. We knew he couldn't be back at Grebel, given how much he professed to hate those lentil burgers, so we wondered what he was up to. Imagine our surprise when we investigated one evening and found him not only at Grebel, but in their kitchen, actually helping Ingrid make those hated items! True love, it appears, can overcome anything, even differences in taste. That was another Thom characteristic. Even if he didn't agree with what you were doing, if he thought it was for the common good, he'd pitch in and help out! Thom Washburn had a great and infectious sense of humor and fun. He used to love driving some of the more studious, rule-oriented members of Grebel crazy. Thom knew when to get serious and study, but he also knew that you needed to have fun and just blow off steam every once in a while. Thom used to enjoy taking Ken Gollan's powerful stereo bass amplifier (with his permission, of course), and aim it out the window at U. of W.'s library, then play Black Sabbath at the highest possible volume. The library would then conveniently disperse the sound through the campus. 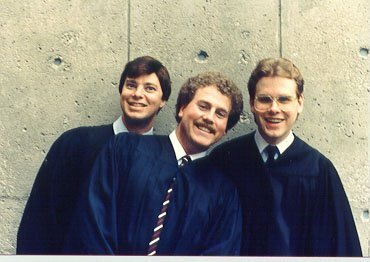 Thom used to delight in hearing everyone on campus wondering where the sound was coming from, and then laugh over them being in disbelief that it could originate from anywhere as peaceful and studious as Conrad Grebel College! Thom even convinced foreign student Nola Kianza to join in the fun contributing loud renditions of Bob Marley or other Reggae music blasting away. Thom broke up laughing. We've had great laughs over this incident many times over the years. He's told this story to many people, and if I'm in the vicinity will often beg me to reproduce "the look" for their amusement. It's certainly difficult to do so through all the laughter! We're so happy that he was able to be part of our experience and we truly appreciate him for just being Thom!